Sweet Fancy Treat: It's Giveaway Time! Sweet Fancy Treat and chicdowntown.com have teamed up to give away an "Elizabeth and James" Deconstructed Tee to one of my readers. To you, yes, to you! This tee (retailing for $90) could be hanging in your closet. And yes, it is part of the "Elizabeth and James" clothing line created by Mary-Kate and Ashley Olsen. Hello fabulousness! I'm very pleased to announce that this is an international giveaway. All you have to do for a chance to win is to tell us why you like the tee, in a comment on this post. The winner will be chosen randomly two weeks from today, on the 16th of July. If you like what you're seeing on chicdowntown.com do stop for a bit on these two pages too: Mystique and the vintage inspired label Minkpink. The itmes in the last one are inspired from high-fashion designers, street style, new trends and vintage pieces. And while you're at it, go check out the chickdowntown.com on Facebook Fan page. Or follow chickdowntown.com on Twitter. So, want the "Elizabeth and James" Tee by Mary-Kate and Ashley Olsen? Leave a comment and tell us why you like it! Go on, hop to it! Good luck! EDIT: The giveaway is closed and we have the winner! Thank you all for entering! Elizabeth & James is amazing! Thanks for doing such a great giveaway! This looks great, and sooo comfortable. I'd love to wear this over a bright fitted tank. Thanks for the giveaway--hope I win! This shirt is perfect for summer over a pair of jean shorts for the day or darker jeans for night. 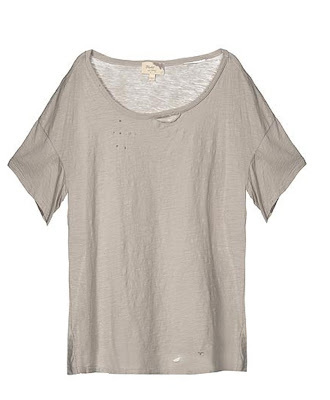 Also the worn look with the tiny holes is a trend on the rise. It gives a person that, "I spent no time on my outfit today, but look how hot I look" appeal and it is definitely something I would put in my closet. Just be careful when washing it because the holes can get bigger. Thanks for the giveaway! I like that distressed look of the tee. I love this tee! It's so casual and comfy looking. Perfect with a pair of shorts for a summer night! I love the destroyed look! I bet this shirt hangs very well. I could imagine seeing it on Mary Kate or Ashley. Cute! Love this shirt! It looks so comfy. Thanks for the giveaway! Love this tee, so comfy looking yet classy. Thanks for the giveaway! I love that it was created by Mary Kate and Ashley Olsen! Thank you! These tees are so cute. They're destroyed just enough to not look gross. Great giveaway. I just love Elizabeth & James! I think this tee is a perfect casual summer look. Great for those hot days! Stevie's earlier comment is so true. I would wear this for the "roll out of bed" effect. Nothing looks better on a girl than an "I don't care" attitude, and the Elizabeth and James tee perfects it. I can see this on either jeans or shorts. Which do you prefer? Love em coz their PLAIN and plain tops are the most versatile garments, me think. You can pair em up with almost everything, it can be a tiny dress if one's petite enough, or broke enough to be pantless. They go with ANYTHING, and it's fun to accesorize plain tops and get creative at the same time have fun doing it. I'd like that tee!! I absolutely love Elizabeth and James! Thanks so much for the chance to win this awesome giveaway! this shirt looks perfect. i can imagine to wear it with some cut-offs on a summerday or with a dark/black jeans for summernights in nice clubs. I like this shirt because the wide neck looks like it allows for a chunky, bold necklace, or even a chance for layering with a racerback tank to give the outfit a whole new look. no wonder it's created by two of the greatest fashionistas in the world! this tee looks so versatile! It would look great plain, with a black vest and some distressed jeans, or a black bubble skirt. Awesome! You guys are totally awesome!! I love the casual chic vibe this tee sends out! I don't really aford things as others but I'm frighting the kitch ;)) in SV :| ...I don't really find chic casual simple clothing that represent me.. :-? only Sh sometimes . Elizabeth & James is amazing! Unquestionably believe that which you said. Your favorite justification seemed to be on the internet the easiest factor to keep in mind of.